Mallya’s debts are a very small portion of the total amount of money owed by various corporates to Indian banks. The gross non-performing assets (NPAs) ratio has more than doubled between 2012-13 and 15 December 2015 from 3.22 percent to 6.78 percent. Mallya apart, what about the other corporates who have borrowed from banks and are now not repaying their loans? If media coverage were to be a reflection of the scale of any problem, then it can safely be said that Vijay Mallya is single-handedly responsible for the crisis in the Indian banking sector. Mallya owes Indian banks around Rs 9,000 crore. This is a very small portion of the total amount of money owed by various corporates to Indian banks. Minister of State for Finance Jayant Sinha shared some interesting data in a written reply to a question in the Lok Sabha, on 11 March 2016. The accompanying table shows us how big the problem of banks’ lending to corporates actually is. The gross non-performing assets (NPAs) ratio has more than doubled between 2012-13 and 15 December 2015. It has jumped from 3.22 percent to 6.78 percent. The gross NPAs ratio is essentially obtained by dividing gross non-performing assets by gross advances, or total loans given by the banks, in this case to corporates. And how do we define gross non-performing assets? According to the Reserve Bank of India, “An asset…becomes non performing when it ceases to generate income for the bank.” When the corporate borrower stops paying interest and repaying the principal on a loan (a loan is an asset for a bank), the bank typically allows for a grace period of 90 days. After this grace period is over, the bank categorises the loan as a non-performing asset and starts setting aside money (or making provisions) for it. The total sum of such loans forms the gross-non-performing assets. It is worth remembering here that a loan being categorised as a gross non-performing asset does not mean that all is lost for the bank when it comes to that particular loan. The bank can recover money from the asset that has been offered as a collateral against the loan. Of course, this is not as straightforward as it sounds. In Mallya’s case, he has also given personal guarantees to banks while taking loans for Kingfisher Airlines. Mallya owes around Rs 9,000 crore to banks. This is a very small amount if one compares it to the gross-non-performing assets of corporate lending carried out by banks. Summary: Yet again we get rumors of serious peace talks in Afghanistan, as almost ten thousand US troops remain there (3 dead YTD). Here Stratfor assesses their odds of success, and evaluates the strength of the Taliban’s insurgency. — The Taliban would agree, as they intend to bring stability, unity, and peace to Afghanistan. After nearly 15 years, the Taliban show no signs of slowing their insurgency in Afghanistan. Hopes that the group would participate in peace talks were recently dashed when it announced it would not do so, even though a small rival Islamist group, Hizb-i-Islami, agreed to be included. Afghanistan, China, Pakistan and the United States — all part of the Quadrilateral Coordination Group for stabilizing Afghanistan — ended their latest meeting in February on a cautiously optimistic note by formally inviting the Taliban to talks. But in early March, the militant organization released a statement saying it would decline the invitation until its demands are met. Then in an unexpected gesture on March 17, Mullah Akhtar Mansoor — leader of the mainline Taliban faction who has been silent since allegedly being wounded in a gunfight in November — released an online statement in Pashto exhorting the Taliban to intensify their fighting. This suggests that Mansoor is motivating the Taliban to launch a spring offensive, even as the organization has, unlike in previous years, fought continuously through the harsh winter months. Second, the group’s demands have not been met. The Taliban want a complete withdrawal of foreign troops from Afghanistan, the release of Taliban prisoners and the removal of Taliban names from a U.N.-sponsored blacklist. Moreover, even if the Taliban were to join peace talks, they would insist on doing so through their political office in Qatar, which Kabul refuses to recognize for fear of bestowing political legitimacy upon the militants. Pakistan’s diminishing influence over the group further complicates the prospect of peace talks. While visiting the United States earlier this month, Pakistani foreign affairs adviser Sartaj Aziz made a startling admission by publicly acknowledging that Pakistan is hosting members of the Taliban, which it has long denied. Aziz said that Pakistan provides medical facilities to elements within the Taliban and hosts their families, adding that this aid could be used to pressure the Taliban to join negotiations. Even so, Aziz cautioned that hosting the organization does not mean Pakistan has outright control over the movement. Indeed, Pakistani officials also revealed that despite threats during a recent secret meeting to expel the Taliban from Pakistan, the militants refused to join peace talks. In spite of the Taliban’s relentless onslaught, peace talks received a small but hopeful victory March 13. A three-member delegation from Afghan Islamist group Hizb-i-Islami met with Afghanistan’s High Peace Council to discuss joining negotiations. The organization has several hundred fighters and is led by Gulbuddin Hekmatyar, a notorious warlord who fought in the Soviet-Afghan war. Hekmatyar briefly served as the prime minister of Afghanistan during the 1990s before taking up arms, first against opposing factions in the country’s civil war and later against coalition forces following the 2001 U.S.-led invasion. Although Hekmatyar did not attend the meeting and is thought to be hiding in Pakistan, his organization’s delegation urged other factions in Afghanistan to stop fighting and to join the peace talks. This week’s attacks in Belgium are a continuation of Muslim-Christian confrontations that began when the Soviet Union fell. The defence industry, more so the aviation sector has been in a state of excitement ever since the announcement was made of “Make in India” with policies to support the slogan. MSMEs not only play a crucial role in providing significant employment opportunities at comparatively lower capital cost than large industries, but also help in industrialisation of rural and backward areas. The aerospace and defence industry is of strategic importance to any nation. It is an acknowledged fact that India needs to increase self-reliance in its own national interest. Mission “Make in India” was launched a year ago, to transform the country’s economy by taking the focus away from the services sector and convert the nation into a manufacturing hub. To achieve success in the initiative, an ecosystem was planned to be put in place with simplified licensing procedures, lesser bureaucratic hurdles and red tape, with an easy inflow of investments; the initiation of the process was to begin with defence manufacturing. New policies have been released in the recent past, more are in the pipeline, and are supposed to provide a thrust to India’s pursuit for self-reliance in defence production; the policies have clauses to support indigenisation and upgrading of technology. But, has this not been the thrust since Independence? Sadly, defence imports continue, even in indigenous products. The Foreign Direct Investment (FDI) limits were increased; a list of items requiring an industrial licence was published in June 2014, and a security manual for the licensed defence industries was notified; projects were cleared by the Defence Acquisition Council (DAC) worth hundreds of crore, but the manufacturing process just did not gather momentum. The policies, the clearances, the increase in FDI, all seemed to favour large private corporates and the Defence Public Sector Undertakings (DPSUs); one sector seems to have been either totally neglected or paid mere lip service – that is of the Micro-Small-Medium Enterprises, the MSMEs. The MSME Development (MSMED) Act, 2006 defines MSMEs based on their investment in plant and machinery, for a manufacturing enterprise, and on equipment for enterprises providing or rendering services. The present ceilings on investment for enterprises to be classified as Micro, Small and Medium Enterprises are as follows:The Micro, Small and Medium Enterprises (MSME) sector has emerged as a highly vibrant and dynamic sector of the Indian economy over the last five decades. MSMEs not only play a crucial role in providing significant employment opportunities at comparatively lower capital cost than large industries, but also help in industrialisation of rural and backward areas, thereby, reducing regional imbalances, assuring more equitable distribution of national income and wealth. MSMEs are complementary to large industries as ancillary units and this sector contributes enormously to the socio-economic development of the nation. Some of the known sectors are the Coir Board and the Khadi and Village Industries Commission (KVIC). The primary responsibility of promotion and development of MSMEs is that of the State Governments, however, the Government of India (GoI) supplements the efforts of the State Governments through various initiatives. MSMEs are the key drivers of long-term sustainable growth. Empirical evidences also show a positive relationship between R&D investments, skilled labour and knowledge spill-over on the one hand, and economic growth on the other. Further, globalisation has also radically changed the geography of innovation, with new players, markets, and opportunities emerging over the last two decades. MSMEs may have more impact on innovation than it would appear from their contribution to R&D activity. In sectors like the aerospace and defence industry, MSMEs contribute most to innovation because of low scale of economies and the high importance of knowledge. It is critical that India’s military present a comprehensive response to cyber attacks from across the border. First, we should augment our technical capabilities through upgrading legacy computer systems, installing firewalls and encrypted communication facilities. Second, we must address the weakest link in the cyber security chain: the human element. The recent media revelations of the Pakistan Army snooping on Indian army personnel’s phones and computers, reportedly through a malware called ‘SmeshApp,’ is the latest instance of the challenges faced by the Indian military in guarding sensitive and classified information such as the deployment and movement of troops and details of counter-terrorism operations like the January 2016 Pathankot airbase attack. Worse, some personnel were allegedly honey-trapped through fake Facebook profiles to divulge confidential information. Exactly how much and what kind of information was funneled into Pakistan remains unclear. But it is evident that cyber threats from Pakistan are gradually moving away from website defacing nuisance-value attacks, to serious cyber espionage. The current revelations come on the heels of the busting of the spy module – which had Indian Air Force and paramilitary personnel who provided national security information to the Pakistan Army’s Inter Services Intelligence. Here too, honey-traps had been used. Espionage is a game, where any country engaged in harvesting information has to keep upping the ante by constantly inventing new methods and developing new sources to acquire information, by hook or by crook. Therefore, taking a dispassionate view of the tactics of our hostile neighbours will help to better understand this espionage challenge, especially because cyber snooping technology has become sophisticated and social media has opened new avenues for connecting and communicating with strangers. In 2014, the Indian Air Force had alerted its personnel with regard to Xiaomi smartphones as the devices were found to be transmitting phone data to its servers in China. In 2012, suspected hackers had breached the computers of the Indian Navy’s Eastern Naval Command and planted malware which transmitted confidential data abroad. The military is taking preventive steps to plug the leakage of any sensitive information, particularly through social media platforms. Banning sites is not an answer, as the Indian army found when it banned Orkut and MySpace a decade ago, as these are observed more in the breach. And, as serving personnel pointed out, no such ban was imposed on civilian officials working in sensitive security postings, even though those establishments are also exposed. In 2013 for instance, an internal inquiry by the Ministry of Home Affairs on its confidential nationwide information-sharing computer network found that 40% of its computers were connected to the internet, despite written orders prohibiting it. The Indian Army now has a social media advisory which prohibits Army personnel from disclosing their identity on social media as well as from discussing operational or administrative matters. "Brussels Blasts: The Struggle to Secure Soft Targets is republished with permission of Stratfor." Only five of 185 classes casually discuss militancy in 45-day annual training programme; imams with radical mindset not considered for the course writes Abdul Kalam Azad in Daily Star on March 2. Imams, who provide religious guidance to local communities, are worldwide considered a key element in the fight against religious extremism. Quoting experts , Azad wrote that Bangladesh is not getting the most out of them mainly due to flawed policies. According to The Daily Star article every year, the government is picking some 3,500 imams from across the country for a 45-day training programme. Ideally, this should have been a perfect platform for launching a campaign to check radicalism. But the fact is, though imams are given lessons on a wide range of topics, the issue of extremism gets little focus in the training, said Azad in his article. Of the 185 classes, just four to five classes discuss militancy. As a result, The Daily Star stated , the training fails to create any serious impact and to involve imams in the counter-militancy campaign, said some imams and officials of the Islamic Foundation, which organises the training. Moreover, imams having radical mindsets are allegedly not considered for the programme although, experts say, such imams should be chosen on a priority basis, says Azad in his article. If these imams with wrong perceptions of Islam are not deradicalised, they will keep misguiding the youths, making the fight against fundamentalism even more difficult, he wrote. Shamim Mohammad Afzal, director general of the Foundation, was also quoted in Daily Star as saying that some radical imams might have been left out of the training, but that was not intentional. He, however, acknowledges that such imams should be included in the programme on a priority basis. Analysis of the training module shows imams are given lessons on Islamic studies, primary healthcare and family welfare, pre-primary, primary and mass education, agriculture and forestation, livestock and fisheries, science and ICT, environment and social development, an introduction to Bangladesh and the world, and activities of the Islamic Foundation, writes Azad in Daily Star. Will China risk India investments by overplaying its hand in Nepal? China’s Nepal policies are changing as a result of India edging closer to the US-led containment strategy against Beijing in South China Sea. What it took for Delhi to persuade Nepal’s Madhesi leaders to come to the Indian compound in Kathmandu on Thursday to celebrate Holi, we do not know. They had earlier taken a vow not to celebrate Holi. They saw nothing to celebrate after the unceremonious collapse of their agitation following Delhi’s decision to end the blockade and ease the pressure on the leadership in Kathmandu. Unsurprisingly, Kathmandu press is rife with speculation that Delhi is preparing for another phase of confrontation and is priming up the Madhesi leaders. “We (India) have at present 26 Land Custom Stations with Nepal... Two Integrated Check Posts are under construction and two more will be undertaken in the next phase. Two rail links are under construction and three more will be undertaken in the next phase... 605 kilometres of roads... are under construction... Another 900 kilometres will be undertaken in the next phase. An MoU on the Raxaul-Amlekhgunj petroleum pipeline was signed... The 600-megawatt Muzaffarpur-Dhalkebar transmission line was inaugurated last month and India... is already exporting 330 megawatts of electricity to Nepal. “Two thirds of Nepal’s global trade is with India, and over 90% of their third country exports/imports transit through India. Millions of Nepalese live and work in India, and hundreds of thousands criss-cross the open India-Nepal border every single day”. Visiting here in northern Iraq, in Kurdistan, and talking to a lot of Iraqis leaves one thinking Obama is not entirely wrong. Sitting through a forum at the impressive American University of Iraq, Sulaimaniya, and watching Iraqi leaders squabble and point fingers at one another did not leave me wanting to buy a lot of stocks on the ISX, the Iraq Stock Exchange. But sitting here also makes you wonder if Obama hasn’t gotten so obsessed with defending his hand’s-off approach to Syria that he underestimates both the dangers of his passivity and the opportunity for U.S. power to tilt this region our way — without having to invade anywhere. Initially, I thought Obama made the right call on Syria. But today the millions of refugees driven out of Syria — plus the economic migrants now flooding out of Africa through Libya after the utterly botched Obama-NATO operation there — is destabilizing the European Union. The E.U. is America’s most important economic and strategic partner and the other great center of democratic capitalism. It amplifies U.S. power, and if it is hobbled, we will have to do so much more on our own to defend the free world. We and the E.U. together have got to think about how to create safe places in Libya and Syria to stem the refugee tide before it breaks the E.U. History will not be kind to Obama if he just turns away. At the same time, Obama has an opportunity that no U.S. president ever had before. Two fledgling democracies have emerged in the Middle East —on their own. One is in Tunisia, whose civil society leaders won the Nobel Peace Prize, after writing the most democratic constitution ever in the region. But today guns, refugees and Islamist terrorists coming from Libya, which we recklessly uncorked, are helping destabilize the Tunisian experiment. The US spends more than $500 million per victim on anti-terrorism efforts. However, cancer research spending is only $10,000 per victim. Evolutionary psychology may offer an explanation for this irrational threat amplification. Over the last decade it has stricken more Americans than terrorists have. It will stop at nothing to destroy our way of life. Yet some politicians in Washington don’t see lightning as a threat. Barack Hussein Obama doesn’t. In the Senate, he voted to allocate hundreds of billions of dollars to the so-called war on terror, while spending absolutely nothing on a threat which has taken far more American lives. He just doesn’t get it. Roughly 3,000 Americans have lost their lives to terrorist attacks in the last decade. This averages out to a loss of 300 people a year, which is a tragic figure and, as a country, it behooves us to do everything we can to reduce or eliminate the threat of terrorism. But there are still a lot of other ways to wind up being the main course at a worm banquet. The gravest dangers we face include heart disease, cancer, and celebrity breakups. Unfortunately, our country doesn’t have infinite resources available to eliminate every threat. So the task falls to our government to allocate what resources we do have in a manner proportional to the magnitude of each threat. If we, as a society, want to effectively counter the dangers we face, we first have to put them in perspective. Ranked by the number of victims, heart disease comes in as the number one threat. It’s responsible for700,000 deaths a year. This coronary malady keeps food on the tables of funeral directors nationwide. And, like a perpetual motion machine, this very food fills their arteries with cholesterol leading to even more heart attacks. On to number two. Cancer kills 550,000 people a year. But ironically, some futurists see it as a potential key to immortality. It removes the limit on the number of times that a cell can replicate itself. Thus, if properly harnessed, this disease could be used to defy aging by allowing eternal tissue regeneration. This would enable Joan Rivers to continue enchanting Americans with her iconic brand of celebrity commentary for generations to come. Runners up for the best solution to overpopulation include strokes with 160,000 casualties a year, respiratory disease with 120,000 casualties annually, diabetes at 70,000 , pneumonia at 60,000 , Alzheimer’s disease at 50,000 , and vehicular accidents at 40,000. As previously stated, averaged over the last decade which contained the worst terrorist attack in our nation’s history, terrorism still only killed about 300 people a year. Compare this to the 1000 people who are struck by lightning every year. Hopefully, by putting storm clouds on the federal no-fly list we’ll be able to reduce this number in the future. But until then, based on current trends you’re three times more likely to be struck by lightning than to be killed in a terrorist attack. A new assessment breaks down the biggest risks to international markets. Phi Beta Iota: The Economist Intelligence Unit (EIU) has in the past earned a reputation for intelligence with integrity. This list is far removed from that reputation. A better list, published by the United Nations High-Level Panel on Threats, Challenges, and Change, offered the following ten ranked threats to humanity. A truly intelligent assessment — which is to to say, one with integrity of purpose and method — would understand that the greatest threat to humanity right now is the corruption of all of its institutions, particularly banks, churches, corporations, governments, labor unions, churches, and universities. In the absence of holistic analytics, true cost economics, and open source everything engineering (OSEE) — none of these present in how the EIU does business — the human species is facing the sixth extinction. The ten “threats” the EIU has chosen to highlight are pedestrian, even petulantly childish, three of them focused on a European Union that has never been more than an industrial cartel in favor of European industries unable to compete effectively on their own, and two of them focused on China in the negative without regard to the Silk Road, the energy and computing break-throughs, and other major developments emergent from the Indonesia – China axis. Terrorism has never been more than a traffic accident, it is a fraudulent fabricated threat with Saudi Arabia being the greatest threat to human balance via its export of state-sponsored terrorism in the form of Wahhabism, and Zionist Israel being the greatest regional threat in the Middle East with its calculated efforts to destabilize and Balkanize. To suggest that Russia is somehow the belligerent in either the Ukraine or Syria is to demonstrate a degree of shameless pandering to the false narrative of the West that once can only lament. Russia — and Iran — are the adults in the Middle East. 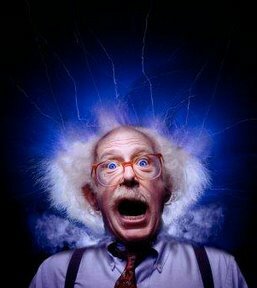 Currency volatility is a function of public awareness of banking toxicity, while oil price shocks are a direct result of the collapse of 25 years of energy crimes — the willful neglect of renewable energy to include the murder of some the more successful proponents for renewable energy rapidly approaching a price point of zero. The future is bright. The future will be determined, as Minister-Mentor Lee Kuan Yew (RIP) has observed, by demography. This means that the BRICS plus Indonesia and Iran will determine the future. Particularly influential will be the cultural and economic axis of good between Indonesia and China, and between India and Iran. Russia will rise steadily and the West — absent a restoration of honest governance in the USA perhaps led by Donald Trump – will continue its decline. Nature bats last. The EIU is out of touch with reality and its intellectual prognostications most suspect. China suffered two major setbacks in the South China Sea this week. First, sparks flew between the PRC and its longtime ally, Indonesia, when the bungled seizure of a Chinese fishing vessel in Indonesian waters almost led to a direct conflict between the old friends. Later in the week, the United States and the Philippines announce a new decade-long pact that will allow American troops to rotate between five PH bases, many close to PRC installations in the South China Sea. Jakarta found itself in the middle of the South China Sea disputes on Saturday after apatrol boat from the Indonesian Ministry of Fishery and Marine Affairs (KKP), KP Hiu 11, seized a Chinese fishing vessel, Kway Fey 10078, and arrested its eight crewmembers for illegally fishing less than three miles off the coast Natuna Island. While the Hiu was escorting the Kway Fey back to base, a nearby Chinese Coast Guard vessel rammed the captured fishing boat near the limits of Indonesia’s territorial waters, forcing the KPP officers to abandon the Chinese vessel. A spokesperson for the Chinese Embassy in Jakarta issued a statement claiming that the fishermen were operating in “a traditional Chinese fishing ground” and “hoped that the Indonesian side could properly handle this issue.” On Monday PRC Foreign Ministry spokeswomanHua Chunying further alleged that the fishing vessel “was attacked and harassed by an armed Indonesian ship” and that the Coast Guard was sent to “ensure their personal safety,” but did not enter Indonesian territorial waters. Indonesian Foreign Minister Retno Marsudi summoned PRC Charge d’affaires Sun Weide to officially protest the Chinese Coast Guard’s violation of Indonesian sovereignty. KPP Minister Susi Pudjiastuti later said that Indonesia feels “interrupted and sabotaged in our efforts” to maintain peace in the disputed waters and warned that Jakarta “may take it to the international tribunal.” Deputy Naval Chief Arie Henrycus Sembiring also told reporters the Indonesian Navy would send larger vessels for future patrols in that region. Minister Pudjuiastuti demanded that China hand over the fishing vessel and rejected China’s request that she release the eight Chinese fishermen. On Wednesday Security Minister Luhut Pandjaitan confirmedthat the Chinese fishermen will be prosecuted in Indonesia. The incident is perhaps most significant in how it differs from recent history. In 2008, the last time that China and Indonesia clashed over claims of illegal fishing by Chinese citizens around Natuna Island, Jakarta remained silent. This time around, however, Indonesian officials explicitly rebuffed pleas by a top Chinese diplomat to withhold information from the media hours after the confrontation. Given the historically close Sino-Indonesian relationship, a flurry of commentary has emerged assessing how this incident might impact bilateral relations. Aaron Connelly at AMTI considers whether Indonesia will abandon its non-alignment strategy of “rowing between two reefs,” and Jeremy Bender reflects on the possibility that the confrontation will presage Indonesia’s realignment with its harder-edged neighbors. Prashanth Parameswaran, however, argues that Jakarta’s policy shift resembles a recalibration more than a radically new approach. WASHINGTON — The American combat role in Iraq appeared to expand on Thursday as U.S. Marines operating from a small outpost provided targeting assistance and artillery fire to support Iraqi troops inching forward to retake Mosul from Islamic State militants. 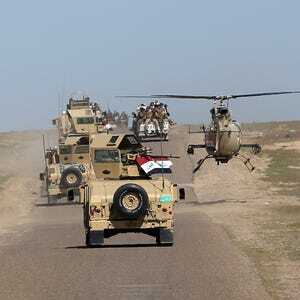 A senior U.S. official said the Marines fired illumination rounds to help the Iraqi forces locate ISIS fighters, and also fired artillery rounds in support of the operation, as Iraqi troops took control of several villages on the outskirts of Makhmour, southeast of Mosul. The official was not authorized to discuss the operation publicly and requested anonymity. Earlier this week, U.S. military officials confirmed the creation of the Marine outpost, dubbed Fire Base Bell. It’s the first such base established by the U.S. since it returned forces to Iraq in 2014. But they insisted that the nearly 200 Marines were only there to provide security for Iraqi forces and U.S. advisers at the nearby Iraqi base in Makhmour. American fighter jets also participated in Thursday’s operation, launching multiple airstrikes on at least two locations, hitting enemy rocket and mortar positions, the official said. The U.S.-led coalition has routinely been launching airstrikes across Iraq against the Islamic State group. A second U.S. official on Thursday said the Marines provided the artillery fire in response to a request from the Iraqi government and that U.S. leaders don’t believe this to be an expanded combat mission. The official, who was not authorized to discuss the operation publicly so spoke on condition of anonymity, said it was considered expanded support for the Iraqis. On Thursday, however, the use of illumination rounds and artillery to support the forward advance of the Iraqi troops appeared to expand the Marines’ role from purely security to more direct combat action, although the Marines were not on the front lines with the Iraqis. So officials have been walking a fine line as they describe the operations of the Marine artillery unit, insisting everything is related to “force protection” of the Iraqi and U.S. forces at the Makhmour base. Defense Secretary Ash Carter has said the U.S. is looking at a number of options to “accelerate” the fight against ISIS. Those options are still under discussion in the Pentagon and have not yet officially been submitted to the White House for approval. The range of options could include sending additional U.S. forces to Iraq, using Apache helicopters for combat missions, deploying more U.S. special operations forces or using American military advisers in Iraqi units closer to the front lines. BEIRUT, Lebanon – One admirer of President Bashar al-Assadof Syria compared him to Charles de Gaulle, the French leader stubborn and confident enough to defy a more powerful ally, the United States, even after its decisive help against Nazi Germany. His critics offer another analogy: the fable of the scorpion that persuades a frog to carry it across the river, then stings it, drowning both. Russia, having rescued Mr. Assad with its air force, is the frog. Now it is swimming for a political settlement to the Syrian war, hoping to cement its renewed status as a global power – but given Mr. Assad’s history, he may very well sink the negotiations and explain, as several diplomats put it, that making deals is not in his nature. Ever since President Vladimir V. Putin’s surprise announcement last week that Russia was scaling back its aerial bombing campaign in Syria, speculation has swirled about whether Mr. Putin’s next move is to force Mr. Assad to make a substantive political compromise to end the war. But while Mr. Assad’s dependence on Russia’s military, money and political influence has only grown during Mr. Putin’s six-month aerial assault in Syria, the campaign has also bolstered Mr. Assad’s confidence and ambitions as it has shored up Syrian government forces. Mr. Assad inherited the presidency in 2000 from his father, who governed for 30 years. He relies on a small, cohesive ruling coterie, mostly members of his family and security officials. While Mr. Putin’s withdrawal appeared to take Syrian officials briefly by surprise, they quickly told diplomats that Russian support was undiminished and dismissed any notion that they were under pressure. Bushra Khalil, a Lebanese lawyer who has longstanding contacts with Syrian government insiders and has met several times in recent weeks with senior officials, including the interior minister and a powerful intelligence chief, Ali Mamlouk, described their mood as buoyant. They insist that Russia is steadfast, she added, but they also hold an insurance card: their even closer relationship with Iran and their ability to juggle two very different allies. Ms. Khalil, who compared Mr. Assad to de Gaulle, is a longtime supporter of his, with a flair for flamboyant statements, and her meetings with officials were not about the war but about a court case involving a son of Muammar el-Qaddafi, the deposed Libyan dictator. But her description of the inner circle’s mood and modus operandi was echoed by many others, both supporters and detractors, who have met with Mr. Assad or his advisers and allies in recent months. They include scholars, humanitarian officials, Syrian associates, diplomats and officials with the pro-government alliance that includes Iran, Russia and Hezbollah. Most of them spoke on the condition of anonymity in order to preserve their access to government officials or to avoid reprisals. Analysis: While difficult, several changes need to be made in the wake of the terrorist attacks in Brussels. Mental shifts will have to occur in the minds of Western, specifically European, leaders on the topics of aviation, intelligence, and the use of military power. Three possible key lessons have arisen from the joint terror attacks in Belgium. All three of them require a fundamental change in investment, effort, agenda, and — most importantly — in the West’s worldview. The first lesson is regarding the worldwide aviation system, which underwent a rare reform after the attacks of September 11: Rigorous security checks before boarding, the prohibition of sharp objects, and the supervision of routes of entry and exit to and from the aircrafts. This reform succeeded: Al-Qaeda made several attempts to blow up planes mid-flight, and they failed. But this reform applied only to the planes themselves. It didn’t affect the airports or other means of mass transit (passenger ships, buses and trains). Brig. Gen. (res.) Dani Arditi, the head of the Israeli Counter-Terrorism Bureau at the time, warned preceding the 2004 attacks on Spanish trains that passenger trains would be the attackers’ next target and that Europe was unprepared. Last August, a Moroccan jihadist planned to commit a massacre against passengers on a train from Paris to Amsterdam. Two marines managed to thwart the attack at the last minute. At the end of October, an ISIS cell in the Sinai successfully blew up a Russian passenger flight midair. 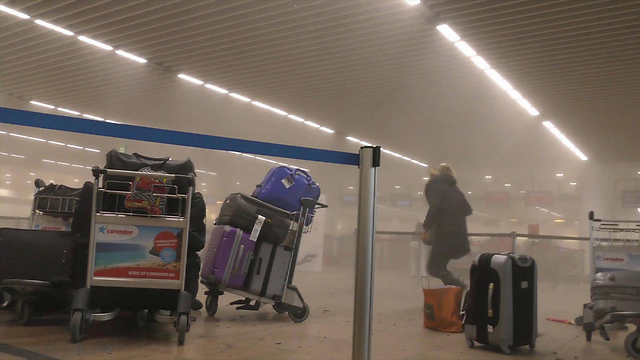 On Tuesday, the attackers operated inside an airport and a subway station. This demands another revolution in public transit, and this time for all the different means of transportation, including the creation of a secured perimeter that includes all stations and ports. That change would entail, however, a great deal of effort, tremendous nuisance to passengers and a massive financial investment. The second lesson is regarding intelligence. The enemy that European intelligence services are facing is young, talented, crosses borders, uses the local population and knows how to coordinate and organize timed operations in short periods of time, employing encrypted means of communication.Against such an enemy, the West must fundamentally change the perceptions of intelligence, coordination, manpower, resources and legislation, as well as make compromises on human rights. Had these two malcontents actually been successful in gaining entry to the nuclear facility and somehow successfully detonated a bomb, compromising the nuclear material — The Daily Mail Online noted that it “could have caused a catastrophe; as the plant lies in a heavily populated area, about 50 miles from each of Belgium’s borders with Germany, France, the Netherlands, and Luxembourg. POTUS Obama has repeatedly said that the Islamic State does not pose an existential threat to the U.S.; and his National Security Strategy — such as it is — emphasizes strategic patience. But, the Islamic State would love nothing more that to get their hands on nuclear material, and/or, some kind of weapon of mass destruction (WMD) and detonate it in a major Western European capital or the continental United States. The activity described above is….as indisputable visual evidence that the Islamic State is indeed actively seeking WMD-type material. Napoleon Bonaparte once said that “one well-placed spy is worth two battalions.” Now, one well-placed spy may be worth an entire city. It is clear that Belgium needs to dramatically alter their current laws with respect to protecting their citizens. As of now, Belgian authorities are prevented from conducting any raids at private homes between the hours of 9pm and 5am, or something close to that — even if they have a court order. The only current exceptions to that rule is if they are present and are convinced an actual crime is in progress, and/or if there is a fire. And, there are other anti-surveillance measures which renders Belgium’s security forces impotent — not to mention a fractured, confusing, and disconnected security structure. Belgium’s security budget has repeatedly been cut; and, the security force suffers from a lack of personnel and adequate anti-terrorism training. With the flood of refugees coming into Western Europe showing no signs of abating, the situation is going to get worse — for the foreseeable future. Finally, we need a serious re-look at the security of our nuclear facilities here at home. 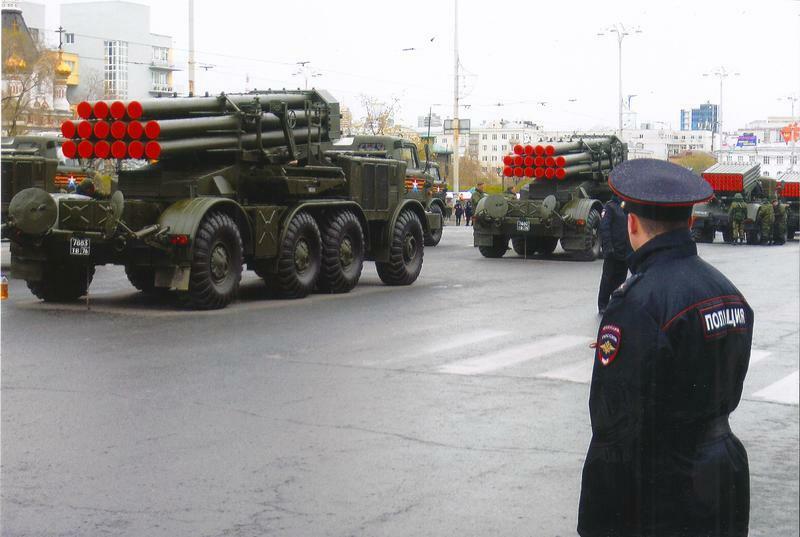 These guys aren’t going to stop their quest to acquire some kind of WMD weapon — as long as they are alive. The latest revelation that the terrorists had been surveilling nuclear facilities in Belgium, as well as perhaps planing the abduction of key nuclear plant official — as a means of gaining access to the facilities — only adds to the level of anxiety and concern. Mr. Coughlin goes on to note that Britain only found out about this botched or failed attempt because of a leak to the media; and, not because of Belgium authorities intent to share such threatening information. “It is a well known fact among the British intelligence community,” he writes, “which responds to any and every piece of intelligence it receives about potential terror cells — that the Belgians are pretty useless when it comes to terror operations. A combination of not wanting to upset Muslim sensibilities; and, the country’s divisive political system has meant that the Belgian security and intelligence establishment has rarely been inclined to take effective action against hundreds of terrorists.” Political correctness wreaking its destructive and tragic but inevitable consequences. 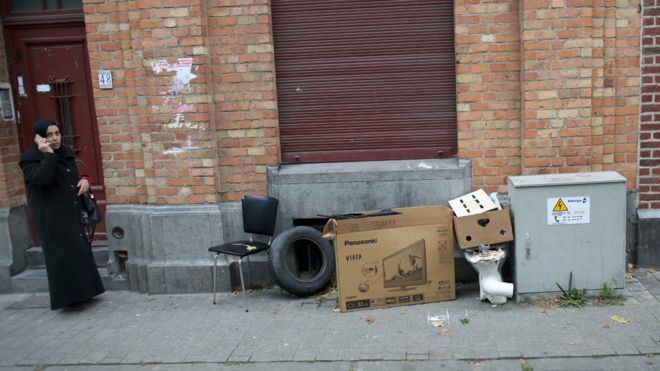 In the poor inner-city areas of Brussels, deprivation, petty crime and radicalisation appear to have gone hand in hand. The BBC's Secunder Kermani has been finding out how drinking, smoking cannabis and fighting - combined with resentment towards white Belgian society for its perceived discrimination against Arabs - prepared some young men for a role as fighters in Syria, and terrorists in Europe. Molenbeek is a place full of contradictions. It's just a few minutes away from the heart of the European Union, but this densely populated district of Brussels has 40% youth unemployment. It's been in the spotlight ever since the Paris attacks in November when it was revealed that the ringleader, Abdelhamid Abaaoud, and three of the other attackers grew up in Molenbeek. They include Salah Abdeslam - who was arrested after a four-month manhunt back in his home neighbourhood. How did he manage to stay hidden for so long? And why have so many young people from Molenbeek ended up as jihadists? Most people in Molenbeek are rather sick of journalists - they resent the way they are portrayed in the media as a "jihadist capital of Europe". But one phrase you often hear when foreign journalists attempt a vox pop is that "terrorism has nothing to do with Islam". Certainly, many of those who joined IS from the area did not come from particularly religious backgrounds. Salah Abdeslam and his elder brother Brahim - who blew himself up in the Paris attacks - used to run a cafe in Molenbeek that sold alcohol and was closed down for drug offences. One friend of the brothers who used to hang out there told me he would regularly see Brahim Abdeslam "watching IS videos, with a joint in one hand, and a beer in another". He said Brahim would spout off radical statements but that no-one took him seriously. Another friend showed me a video from a Brussels nightclub of the two Abdeslam brothers on a night out with girls, drinking and dancing - this was February 2015, just months before they started to plan the attacks in Paris. The network that the Abdeslam brothers had around them - based as much on personal loyalty, disenchantment and petty crime as radical ideology would be key in helping Salah escape after the Paris attacks. 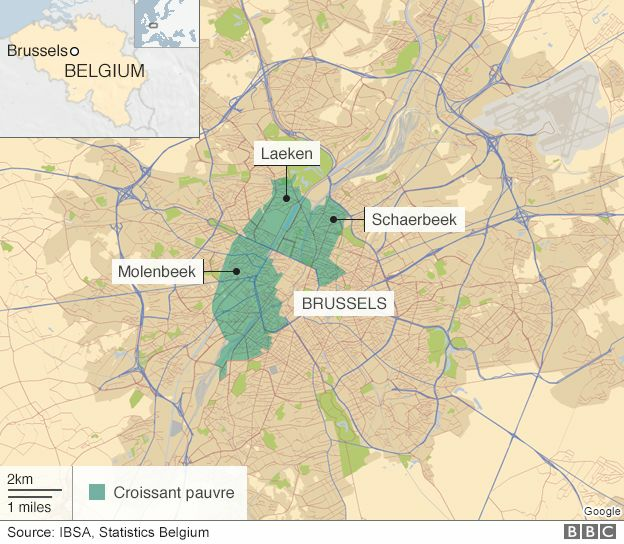 The network was not just in Molenbeek but stretched across the so-called "croissant pauvre" (poor crescent) of Brussels - a semi-circle of deprived inner-city neighbourhoods including Schaerbeek, where Salah had a safe house, and Laeken, where some of those who helped hide him grew up. While making a documentary for Panorama, I read the transcript of the interrogation of two of Salah Abdeslam's friends, whom he called on the night of the Paris attacks asking for help. Hamza Attou and Mohammed Amri tell police Abdeslam said he had had a car accident and needed to be picked up. Attou claims that once they arrived Abdeslam threatened "to blow up the car if we didn't take him to Brussels". But Amri then goes on to describe how the three men drive around Paris for about "the time it took to smoke a joint" before attempting the journey back. According to Attou, they try to drive along smaller, quieter roads - but end up lost and back on the motorway. Then they smoke a further three joints on the drive back to Brussels - they are stopped at three separate police checkpoints but allowed to pass. At one, according to Attou, a police officer "asked Amri whether he had drunk. Amri said, 'Yes'… The police officer told Amri it wasn't good to have drunk, but that wasn't their priority today." Back in Brussels Abdeslam changed his clothes and his appearance. According to Attou, he went to a barber's where he "got himself shaved, trimmed his hair and shaved a line on his eyebrow". He then called another friend and told him to drop him off in another neighbourhood. These three friends were all arrested a few hours later. According to another of the circle, "they are all in jail for nothing - just because they helped Salah without thinking". Abdeslam would remain on the run for the next four months before being arrested. It may be hard to imagine anyone agreeing to help someone involved in an atrocity like the Paris attacks - but it seems Abdeslam was able to draw upon both a network of IS supporters, and also a small network of people who were not necessarily extremists, but who felt a sense of personal loyalty to him - and a mistrust of the Belgian state. So the divisions that we have within the JTNC support that chartered mission that we have. It centers primarily around setting and recommending standards for approval across DoD and industry. We do waveform analysis, we do conformance and compliance evaluation, certifications, and then we have an export office that works supporting these services in [the Office of the Secretary of Defense], doing export, providing support for export type of activities. It might be a license request. We don’t sign that request, but we provide input to it. They might ask a question like, “Is there any implication for critical information if we release it to Country A?” We could provide input to that, because of our knowledge and understanding of a particular waveform, like soldier radio waveform or wideband networking waveform, something like that. So, those are our four key divisions. What is the waveform repository? WYGAL: If we’d talked this time last year, it was just being brought online. The waveform information repository for the Department of Defense is up and running now. Vendors and industry partners who are authorized can come and request access, and if they have the appropriate need and are authorized, they can go ahead and have access to any of the waveforms or other types of software artifacts that are in there. They can utilize those to help support that program office they’re working on.